All compensation matrices, either acquisition defined or FlowJo defined. Keywords associated with your data files. For more on workspaces, please see our description of the FlowJo Workspace and reconnecting samples to a .wsp file. 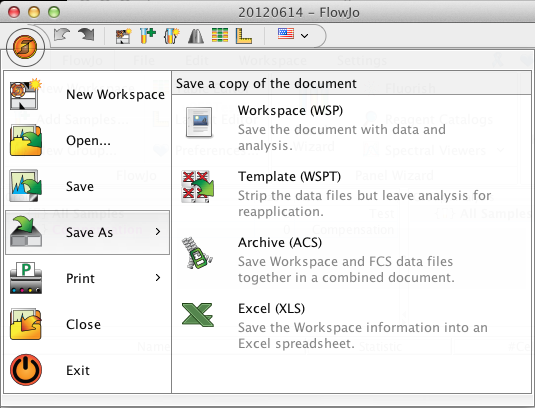 Note that FlowJo DOES NOT save your FCS files as part of the Workspace. Rather, FlowJo saves the relative path to a set of FCS files and accesses the files, as needed, each time a Workspace is opened. A template is a snapshot of your analysis without the corresponding FCS files. Templates are very useful for repeated analysis, as the .wspt file saves your group organization (including compensation group), gating tree, and batched analysis and exports from the Table Editor and Layout Editor. FlowJo provides the option to save your files into an ACS (Archival Cytometry Standard) container, which contains your FCS files and the workspace into a single file similar to a compressed .zip file. For more information, please see our site discussing ACS files and the International Society for Advancement of Cytometry’s document on ACS files. This will allow you to recreate your Workspace structure for use in a spreadsheet program, by saving a spreadsheet file with all columns and rows of your current workspace including all gating and statistics.